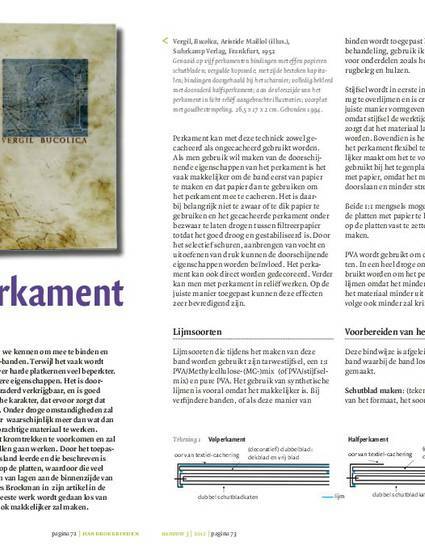 Translation into Dutch for Handboekbinden (Journal of the Stichting Handboekbinden) by Marlene Hoogeveen of: Peter D. Verheyen. "Vellum on Boards" The Guild of Book Workers Journal 39 (2004). Vellum is arguably one of the most beautiful binding materials in use, and at the same time one of the least used in modern design bindings. While it is often used in limp bindings, its use “over hard boards” has been much more limited. A study of the bookbinding literature reveals it being covered in-depth to a larger degree in German language trade manuals than in English. This could explain their seemingly greater popularity in Germany, as evidenced by reproductions in exhibition catalogs and other publications. With a decline in traditional training opportunities, it is becoming increasing difficult to find exposure to this technique. As a material, vellum has many wonderful characteristics. It is translucent, can be made transparent, is available dyed or veiney, and exceedingly well wearing. Its major drawback is its hygroscopic nature, causing it to stretch as it absorbs water and to shrink as it dries. In dry conditions this will cause the boards to warp strongly. This, perhaps more than anything else, has discouraged binders from working with this wonderful material. This article describes how to complete a binding using this technique.